Hey hey now it’s already Day 3 and today I’ve got ONE lovely prize for ONE lovely winner! We have a winner! Congrats to Robin W of simplysouthernbaking.com! In case you haven’t heard, we’re celebrating the new redesign of DYOB with 7 days of giveaways from 10 incredible bloggers! Read the full story and details of the redesign here. So we all know that choosing the right fonts is important, but what’s even more important than that? Copywriting. Having the right copy for your about page, home page or a landing page can be the difference between visitors staying or bouncing. So today’s giveaway is super duper! 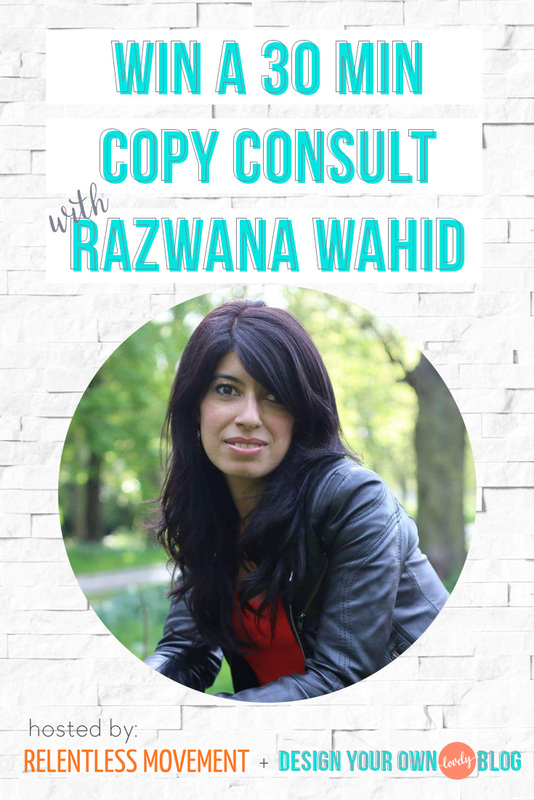 Get a free 30 min copywriting consult with the copywriter-extraordinaire, Razwana Wahid! Do you know why I am so excited about this? I think Raz is amazing! 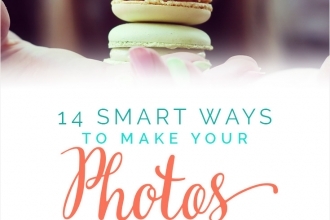 She helped me write my own About page and the landing page for my Blog Beautiful ebook! – Does this speak to my target audience? – Does the page make sense? Is it too busy? Does it flow? – Would anyone actually buy or opt in after reading this page? … it’s time to hire a professional copywriter – your secret weapon to winning the hearts and wallets of your audience. But when copywriters charge as much as $300 to even look at your copy, you know you’re in luck when a 30-minute copy consult is today’s prize! One 30 minute copywriting consult will be given away. Entries made starting now through 6am (MST) tomorrow (8/13) are valid. One winner will be selected at random on Tuesday and announced right here on this page! Go visit Raz’s website now and see what she’s all about! I need help tweaking my About page. Oh man. My about page for sure. I haven’t put together a sales offering yet, so I have to count on my content and about page to build my email list and keep people around! Oh wow, probably my home page. It’s so disorganized and there really is no theme to it. I loved Day 3 of the re-design. Over the past month, I have been looking at adding some new fonts, but think it will be important for me do a brand guide, like you did. If I were to win the giveaway, I would love copywriting help on my About Me page. I feel like there is so much I want to say, but then I don’t know if it is cohesive. I’m in the same boat as Jenny above ~ I do not have a sales product yet or even an opt-in gift so it’s my content and about page that gets others to join my email list. Help with my About page would be awesome! I’m already on Raz’s email list and can attest to the quality copywriting tips she shares. Sure sure sure!!! I SO need help with my About page, and the sales pages for my two key products… haha I’m sure I could chew Razwana’s ear for hours… but a 30 minute consult would be absolutely awesome. Just signed up for her “website copy that sells”, so I’m keen to check that out beforehand (‘cos I’m gonna win of course). julie recently posted…What does an artist need to be successful? And the timing for this post is perfect — I’m spending lots of time looking at fonts these days! Hi, this would be a fabulous opportunity,my homepage,my about page, and honestly a page I am about to create for a new e-book all need some serious help. Thanks for the opportunity.